Across the street from the Cloisters in a nice neighborhood in up-up-town Manhattan. Its a nice, quiet, gated community with a pretty courtyard; laundry room in building. Grocery store and great cafés across the street. Only a 30-second walk from express A subway (20 minutes into midtown). 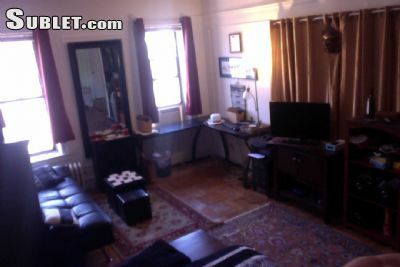 Room can come furnished if youd like (nice mahogany bookshelves, table, mirror, etc.) Its all optional. Feel free to bring all your own things if you need. Two large windows overlooking church. Very large kitchen. And two very cool roommates (each with their own very large bedrooms). Im a working professional who teaches college students and travels a lot. Bookish and laid back. If you fit the bill, contact me. Youll get a really big bedroom in a great neighborhood with two nice roommates for a low price.